It was the best of times, it was the worst of times...., but at least it's over. In 2009, here are the geoscience-related events that got our attention or have long term importance. • Arizona is the #1 state in the nation for non-fuel mineral production, for the 4th year in a row. • The price of copper falls with the collapsing economy, prompting massive layoffs at the Morenci and Pinto Valley mines, and postponement of some other projects. • But the price of copper rebounds by the end of the year with a 16-month high and projected continued increases through 2010. • Secretary of Interior Ken Salazar 'segregates' nearly 1 million acres of public lands in northern Arizona, halting new mining claims and exploration while he decides whether to put the lands off limits for 20 years. • Meanwhile, Denison Mines got final approval to re-open the Arizona #1 uranium mine [right, credit Denison Mines] in the segregated area. Anti-mining groups immediately filed suit to halt the planned 2010 start-up. 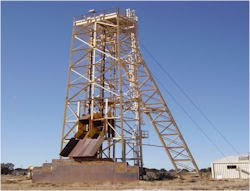 • Resolution Copper sinks their main shaft 1,000 feet near Superior in hopes that Congress will approve a private-federal land swap needed to make the proposed underground mine feasible. • The Forest Service decision on the Rosemont Copper mine south of Tucson is set back in the face of opposition from Pima County, local Congressional reps, big area water users, and some local residents. Eco-terrorists attack the homes of two women who work for the mining company. The Secretary of Agriculture puts the ‘no action’ option on the table. • The Asarco bankruptcy attracts a number of suitors, including Indian company Sterlite Industries. The Sterlite bid draws wide support but loses out to the court’s decision to award Asarco to Grupo Mexico. The year ends with acrimony over bonuses requested by former company officials and Asarco’s attorneys. 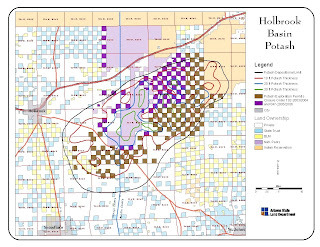 • Exploration began in the Holbrook basin to evaluate the newly recognized giant potash resources. A large mineral lease-purchase deal was announced for private ranch lands within the boundaries of Petrified National Park. • 2009 and the whole decade were among the driest on record. • The first rounds of battle over the impacts of pumping water from the Big Chino basin [right, credit ADWR] was decided in Prescott’s favor, allowing them to pump nearly 8,600 acre-feet of water per year from their Big Chino Water Ranch. 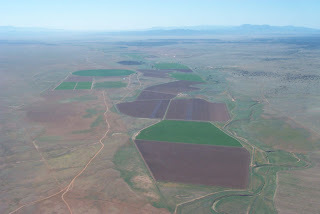 • Proposals for development of giant solar energy farms on public lands across Arizona and the West, prompted BLM to put all plans on hold while the impacts are evaluated. Concerns of new ‘water wars’ were raised over the expected demand for groundwater by the renewable energy plants. The recession hit all sectors of the geoscience community. Downturns in construction affected demand and prices for copper, with layoffs, closures and reduced work for service companies and consultants. • Universities took significant budget cuts with resulting furloughs, salary cuts, layoffs, and staff reductions. Despite this, ASU’s School of Earth and Space Exploration is undergoing its largest recruitment ever for new faculty, as part of a strategic focus in this area. • State and local governments were equally or even harder hit. Arizona State Parks is considering shutting down some or all of its parks, including Kartchner Caverns, although there was talk of selling or leasing parks to private operators. A state legislature committee is considering examining options for the future of the Arizona Dept. of Mines and Mineral Resources including splitting off the Mining and Mineral Museum in light of budget cuts. • The Phoenix Mars Lander managed at UA, reaped a series of national awards and was lauded for its discoveries about water on Mars. • The ASU-run Lunar Reconnaissance Orbiter Camera was successfully put into orbit around the moon and returned spectacular images of the Apollo landing sites, including the lunar landers and astronaut trails through the lunar dust. • UA planetary scientists mapped methane lakes on Saturn’s moon Titan. 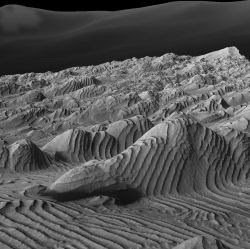 • The UA-managed HiRISE camera on the Mars Reconnaissance Orbiter returned thousands of dazzling images that bring Mars alive [right HiRise image of cyclic sediments]. • A magnitude 6.9 and aftershocks in the Gulf of California sent shock waves (both physically and emotionally) across southern Arizona causing buildings to sway all the way t o the Phoenix region. 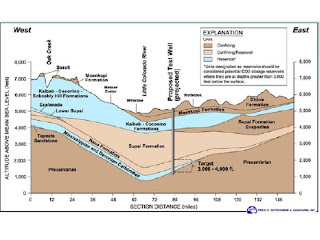 • A test well [right, credit WestCarb] near the Cholla Power Plant in northern Arizona failed to find permeable geologic units that could serve as sequestration sites for CO2 from power plant exhausts. • Dust is becoming a bigger concern, with more restrictions on disturbing the soil coming this new year. 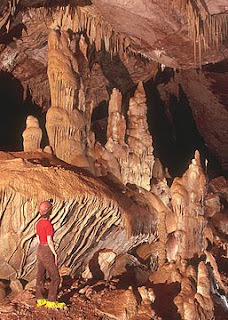 • Kartchner Caverns State Parks celebrated its 10th anniversary [right, credit AZ State Parks]. • Grand Canyon National Park celebrated its 90th anniversary and was once again the #1 tourist attraction in the state. • National parks in Arizona received $20 million in federal ‘stimulus’ funds to take care of a backlog of repairs and improvements. • AZGS received a conditional award of $17.8 million from the US Dept. of Energy to deploy the National Geothermal Data System that could become the basis for a national geospatial data network. 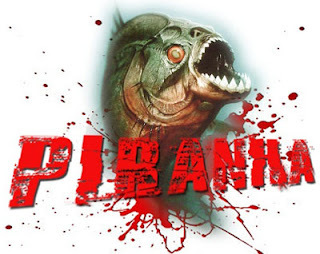 • A sci-fi horror film, “Piranhas 3D” [right] was filmed at Lake Havasu using a far-fetched plot of giant prehistoric fish being released from their underlake caverns by an earthquake. Watch for it in theaters in March 2010. • State Senator Sylvia Allen became a YouTube celeb for her comments during a legislative committee hearing that the Earth is only 6,000 years old. National news media picked it up and the Senator received some dubious ‘awards’ from certain commentators. This is just my personal list. It’s not comprehensive and I probably missed a lot of important events. Feel free to add your top picks.